Axliliary Hyperhidrosis Surgery (also known as “Sweaty Armpit Surgery”) is performed to correct excessive sweating from the armpits. The sweating is unrelated to exercise or overheating, occurring spontaneously, embarrassing and spoiling clothing. Surgery is uncomplicated, very successful, with a very low incidence of failure, with a minimal scar high in the armpit. Downtime is seven days. 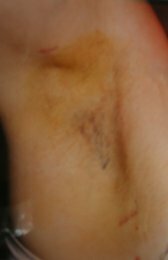 Surgery involves curettage of the offending sweating glands which are enlarged and more numerous than normal, via a minimal incisional line placed high in the axilla. 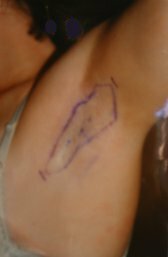 Area of sweating marked out, after iodine starch test with incisional lines marked. small dark pigmented areas where minimal sweating is occurring. As shown with starch / iodine test. 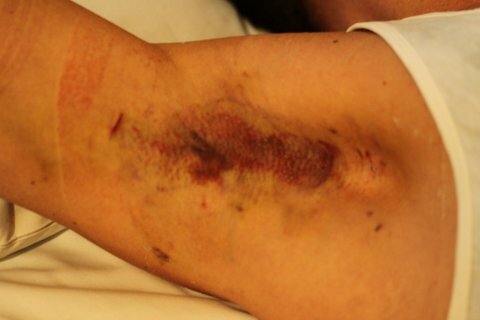 Post Op Right Arm – – Well healed, minimal sweating with starch / iodine test. Axillary Hyperhidrosis Cosmetic Surgery results in the elimination of excessive sweating under the arms. 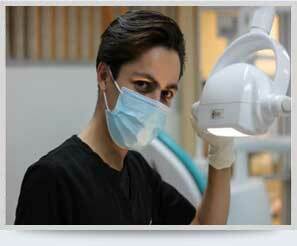 This removes the embarrassment of “wet” and “spoilt” clothing after the surgery. Patients are able to wear all clothing, especially darker colours, and play sport witout the fear of wet and smelly armpits.